Named in honor of Elizabeth I of England, Elizabeth Stuart was born on August 19, 1596 at Falkland castle, in Fifeshire, Scotland. 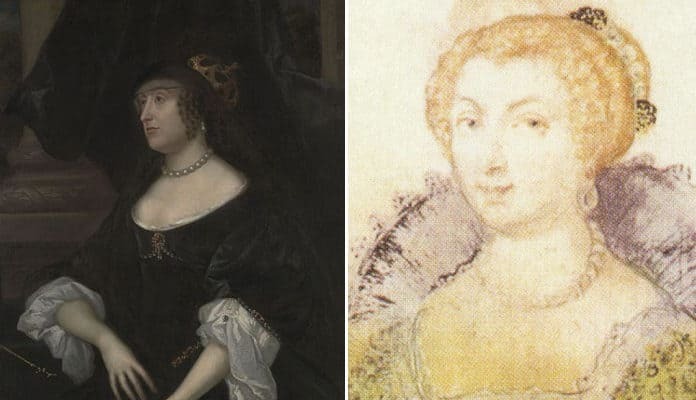 Elizabeth, as the second child and eldest daughter of James VI of Scotland and I of England and his Queen, Anne of Denmark, was never destined to be a Queen. However, she had brushes with not one but two European thrones. For Elizabeth was the monarch of choice for the men behind the Gunpowder Plot who, if successful, planned to put her in her father’s place as a puppet Queen. Then, during her marriage to Frederick, Count of the Palatine of the Rhine, Elizabeth became Queen of Bohemia for just one year, earning herself the title, The Winter Queen. Elizabeth may have been a thwarted Queen, however, she continued to be a forceful and energetic ruler who fought for her children’s territorial rights. Elizabeth also acted as an inadvertent stepping-stone between two British Royal Dynasties. For although she never ascended the throne of England herself, it was because of Elizabeth’s Stuart lineage that the Hanoverians ascended to the British throne when her grandson, George, Duke of Brunswick-Lüneburg, became George I of England. The extraordinary story of this would be Queen, and the dynasty she founded begins in 1605 when Elizabeth was just nine years old. In 1603, Elizabeth’s father, James VI of Scotland became James I of England after the death of Elizabeth I. James immediately left Scotland, for London, where he established his power base. Elizabeth, her mother, Queen Anne and the heir to both thrones, her brother Prince Henry, quickly followed “in a triumphal progress of perpetual entertainment. “However, once in England, the seven-year-old Elizabeth did not join her parents at court. Instead, she was commended to the care of Lord and Lady Harrington at Coombe Abbey in Warwickshire. However, the real world was threatening to encroach upon this comfortable existence. In 1605, a Catholic plot was hatched to kill King James. James was not known for his religious intolerance, and the plotters saw his death as the opportunity to pave the way for a Catholic restoration. The plan was to blow up the King and Prince Henry during the opening of parliament. Then, the plotters would initiate a revolt in the Midlands and install a new monarch. James’s only other son, Charles, was considered too young and feeble to make a suitable public figure. However, the plotters believed the nine-year-old Elizabeth would make the perfect puppet Queen. “The Conspirators of the Gunpowder Plot.” Wikimedia Commons.Public Domain. For the plan to work, the plotters had to lure Elizabeth’s guardian, Lord Harrington away from his charge. So he was invited to a fake hunt. However, Harrington was suspicious. He had heard that a group of Catholics, headed by Sir Everard Digby were meeting at nearby Dunchurch on November 4th. When he heard that someone had stolen all of a neighbor’s horses, the pieces fell into place. Realizing that “some great rebellion is at hand,” Harrington refused the invitation and without waiting for royal approval, spirited Elizabeth away to the safety of the town of Coventry. The rest is history. The plot was foiled and King James and Prince Henry saved and the conspirators executed. When she learned of the plan to place her on the throne, the shaken Princess remarked, “what a queen should I have been by this means? I should rather have been with my royal father in the parliament house than wear his crown on such condition’. Elizabeth returned to Coombe Abbey until finally, aged 14; she made her debut at the English Court. Her beauty was a talking point. However, it was political and dynastic connections that would determine Elizabeth’s future marriage.